We’re here! We made it! It’s amazing… a miracle really. How those one gazillion bits of stuff and junk made it from there all the way over to here completely stuns me. We had the very best movers ever. They knocked it OUT! The best moving experience I’ve ever had. If you’re in the Chicagoland area and moving I highly recommend them… usa movers. We’re falling over tired, completely surrounded by a fortress of boxes to unpack, ikea furniture to assemble and projects to complete but I’m so flippin happy. I guess it finally sunk in… our own house! I’m having lots of little happy warm fuzzy moments. Seeing Oscar coming up the basement stairs and thinking how tiny he looks and imagining all the times he’ll be walking up those stairs to me progressively getting bigger and bigger or watching him chase a butterfly in the backyard or waking up the first morning and realizing we look up at an evergreen outside our bedroom window. It’s such a relief to be able to finally feel some calm in the middle of chaos. And how about a little gorgeous in the middle of this mess. This breathtaking doll quilt came in the mail from one of my oldest and dearest internet friends, Jen. And yes… it’s all Liberty prints!! I see she blogged it today so there’s more info and pics on this amazing quilt over here. I had to pull some packing tape off a box so I could stick it up on Junebaby’s wall right away and admire it. So pretty! Thank you Jen xoxo! Welcome to your new home! I’m glad to hear that you had a positive moving experience despite the exhaustion moving entails. I saw the blog entry about your gorgeous doll quilt–it truly is fabulous and I think it’s so wonderful that your dear friend gifted you with it. When I decided to put up the blog post today, I just had a feeling that you had already unwrapped the quilt. I was right! So glad to hear that you are safe and sound in the new house, with fun new things to do and explore as you unpack…and that I did not ruin the surprise. hurray! I was hoping all went along smoothly- the weather was gorgeous which I am sure made it all the more festive. congratulations- what a fun time. How exciting!!! Can’t wait to see all those quilts up in Junebaby’s room. We moved from the Chicago-land area and I so miss being that close to IKEA. Ours is supposed to open this August and I have a list started already. Hoping the rest of the unpacking goes smoothly! Welcome home! I can’t hardly wait to see what you do with the house. What a wonderful (if not wee) new beginning! I have been checking the shop all day for the spring stitchettes… did I miss them? Is it just me or did I read somewhere that we could purchase them today? Did you ever think you would get such a response to your decorating idea? What you’ve got is heirlooms for your daughter. Maybe you could photograph each quilt and write up a little description about the person who made it for her. It would be an nice album to have to go with all the lovely quilts. Can you imagine giving it to her when SHE has a baby? Wow. And your own house? Wow! Don’t forget to mark his height in an out of the way spot so you can remember how little he was when you moved it. My parents always did this for us on the first of the year and it was so fun to look back every year and see how we’d grown! So glad you movd in!! I cant wait to see all you house pictures. Oscar looks like he’s having fun with thoos boxes! Cant wait to see all those doll quilts up on the wall! Congratulations on the move! Yay! Happy home! Sounds great. All those warm feelings that surround a family home. I’m looking for a new home for my little family and gosh it’s hard. Really really nice to read about your success. Owning your own home is fantastic – i still get that fuzzy feeling now, and we’ve lived here for almost a year! Glad you are getting settled…so happy for you. Now to prepare for the next beg event! Love the quilt…you are blessed with wonderful friends, Hillary. oops. big event…not beg event. Sheesh! Welcome to Wheaton! Glad to have you in the neighborhood. And that quilt is really gorgeous – I can’t wait to see pictures of the whole wall, covered in beautiful quilts. Congratulations on the move. That is always exciting. We are trying to buy our first house now, and I hope we can find something before the end of June and be able to experience that same excitement. Jen’s quilt is beautiful – and inspiring! I always love your photos and inspirations. There is some comfort within them. So glad it all went well. Hope you’ll be very happy in your new home, ALL of you. 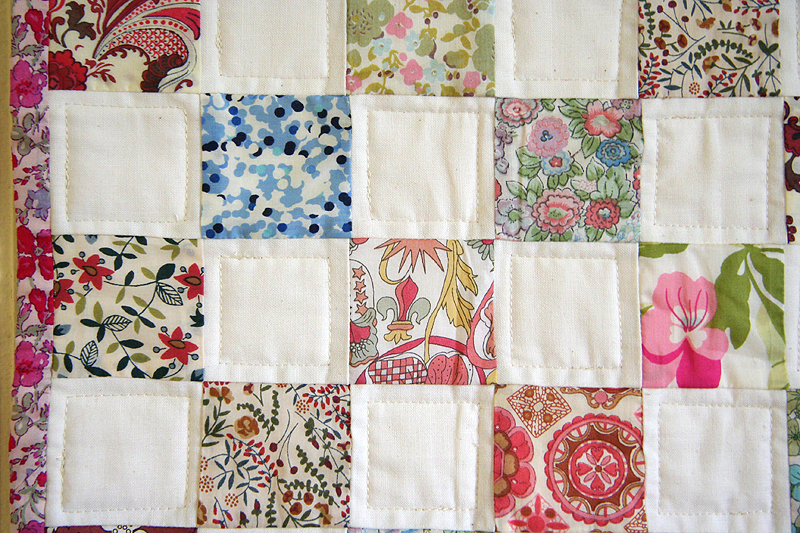 Gorgeous little quilt. 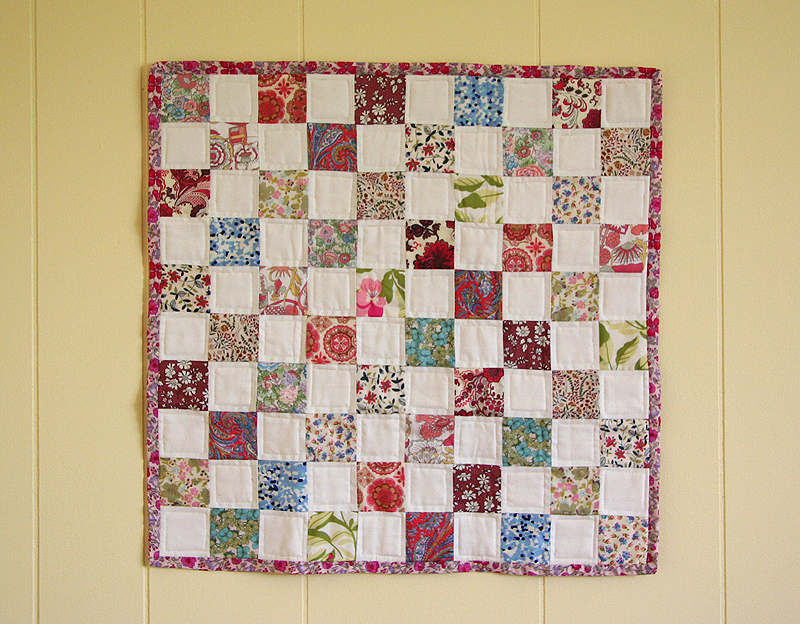 Junebaby’s going to have the prettiest room in the house with all those lovely doll quilts. Sometimes you just have to have an oasis of beauty and calm amid all the upheaval. Love it. oh so happy to hear the move went well! I know so many people have horrible moving company experiences, so happy you didn’t!! and bring on the warm and fuzzy moments! okay-Jen’s doll quilt is just lovely. sigh. sigh. Hang onto that new house excitement as long as you can! After seven years in our house, I’ve been trying to reminisce back to those new-house days…the view out the window from your bed in your very own house…you nailed it right there. We were building it while I was pregnant and although we wanted to have a girl, we just couldn’t imagine anything other than boys living in this house at that time. Funny to think back to that now. And the house still is far from done, by the way. We figure that we’ll finish it after the boys are grown and gone. Oh happy day! Congratulations, Lang Family. You had me misting up there with that bit about seeing Oscar coming up the basement stairs. Enjoy, enjoy! congratulations! i am so glad it all went well- good smarty pants, we were dumb and moved ourselves trying to save money! it was THE worst. So glad you made it! You must be so happy and relieved that it’s over! The quilt from Jen is awesome. How wonderful is that? I am glad the move went well. Congratulations! That good feeling keeps getting better for us a year after our move from a cramped apartment to our very own house. Wishing the same for you. I’m so glad your move went smoothly! I HATE moving more than anything else and will have to do it again in a few months and am already dreading it! The doll quilt is fabulous. Congratulations on being in your new home! I’m so glad you love it. The paint over the paneling looks gorgeous! Good on ya!